The rotator cuff tendons and bursa reside in the narrow space between the top of the humerus (upper arm bone) and the bottom of the acromion (part of the shoulder blade located at the top of the shoulder). When the arm is relaxed at your side, this space is sufficient. But when the arm is moved away from the body (abduction), this space is narrowed and the residing structures can be compressed. In a healthy shoulder, this does not cause any pain or irritation. In an unhealthy shoulder, this compression can cause irritation, resulting in pain and inflammation of the tissues. Inflammation and subsequent swelling take up space and further aggravate the shoulder during reaching and overhead movements. It is not uncommon to develop a bone spur in this area on the underside of the acromion. This results in an even smaller space and predisposes someone to “impingement” of the tissues, causing increased irritation and pain. Symptoms for shoulder impingement are diverse in presentation and severity. The listed symptoms should only be thought of as a generalization of the symptoms associated with this disorder. A discussion of your symptoms, a physical examination, and X-rays are useful for a diagnosis. Your specialist may recommend having an MRI as well. Physical therapy, anti-inflammatory medications and cortisone injections are the most common treatments. 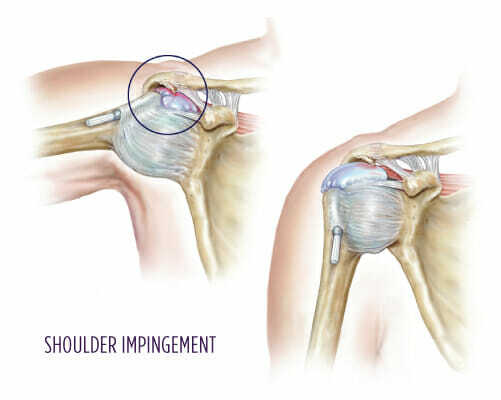 Arthroscopic surgery may be necessary to relieve the symptoms of shoulder impingement for some patients.